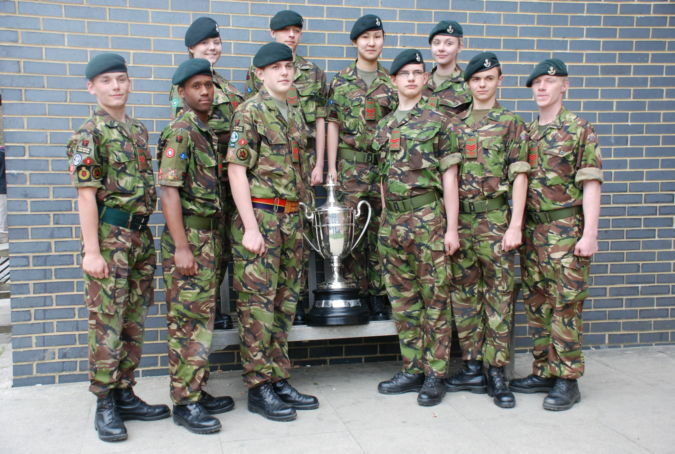 On 31st March 2012 a team of cadets from Chester-le-Street Detachment Durham ACF won the coveted News of the World Challenge Cup competed for by teams of four Army Cadets from detachments all over the UK. The News of the World Challenge Cup is one of the most hotly contested competitions in the world of Army Cadet small bore shooting and this is the first time in living memory that a team from Durham ACF has won the competition. Members of the winning team were Cadet Serjeant Gray, Cadet Serjeant Towler, Cadet Corporal Choi and Cadet Corporal Neto. What makes the victory all the more remarkable is that their competitors in the final were another team from Durham ACF, comprising of Cadet Company Serjeant Major Calcutt, Cadet Serjeant Calcutt, Cadet Lance Corporal Yhia and Cadet Corporal Smallwood. Both of these teams qualified for the shoulder-to-shoulder final match at Bisley after two hard-fought qualification rounds involving dozens of detachments from around Britain. The Chester-le-Street team won by the narrowest of margins - only two points. The two reserves, Cadet Serjeant Taylor and LCpl Collins, participated in the reserves competition and took second place. The two Durham cadet teams also shot in a match against the Air Training Corps (ATC) and Sea Cadet Corps (SCC) as part of the same competition. On this occasion they were less lucky and the ATC won with the Durham teams being placed second. However, the Durham cadets were confident that they would be back at the finals next year and would be ready to make the ATC fight hard to retain their trophy.